This NURBN2012 nursing practice pathophysiology assignment discuss on pathophysiology and pharmacology nursing. This is an essay based case scenario assessment. Kevin who lives alone on his farm, was newly diagnosed with Atrial Fibrillation (AF) when he presented to hospital following a transient ischemic attack (TIA). He has been discharged from hospital and is now being managed medically. Kevin needs education and support with understanding his new diagnosis and how it impacts upon his everyday lifestyle. He also needs assistance with managing his medications and modifying his everyday activities to decrease risk of morbidity associated with his illness. 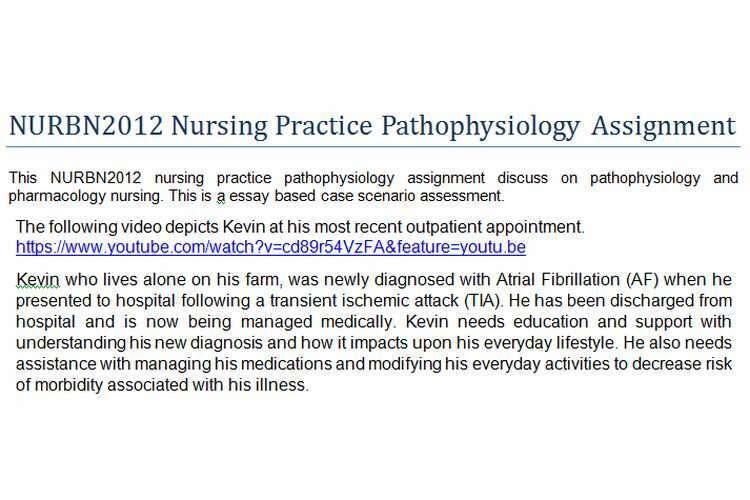 For this assessment task, you are required to write a 1500-word essay which addresses the main issues associated with providing nursing care for Kevin and assisting him to manage both the physical and psychological impacts of his new diagnosis. You will need to explore the pathophysiology, pharmacology and nursing management of the case and demonstrate your understanding in the answers you provide to the following questions. Your answers should be informed by your reading of current research and literature. What is the pathophysiology associated with haemorrhagic and ischemic CVA and discuss the precipitating factors for each? Briefly discuss the risk of CVA in patients who have already experienced a TIA. Compare the side-effects and lifestyle impact of taking vitamin K antagonists to that of the novel oral anticoagulants. What measures would you take to ensure that Kevin remains compliant with medication and follow-up care? How would you ensure that Kevin can recognize the signs of CVA? How will you assess Kevin’s understanding of the information that you have provided to him? This assessment is to be presented in an essay format, which includes an introduction and conclusion. Do not rewrite the case study in your introduction. Please respond to the questions in a logical format. Dot points are not acceptable. It is acceptable to use headings at the start of new topics if this makes it easier for your essay organization. However, avoid creating a question and answer document. References must be current, preferably from the past five years and no older than ten years, unless it is of historical significance, in which case a brief statement of the historical significance must be included when citing the source. Your writing should demonstrate wide reading from a variety of sources, such as, journals, texts and clinical practice guidelines.